Although not everybody is taken by the MIUI aftermarket ROM for Android, some of its more favorable features have been plucked and ported through to those running other software, leaving MIUI looking much like a garden picked of its most treasured fruit. Of course, if you can have the best features of something without needing to install it, chances are, you’re not going to bother installing it. A couple of days ago, we showed you how to enjoy the MIUI File Explorer on your rooted Android device, and now we’re going to demonstrate how you can also have a taste of the MIUI Music Player too. As usual, the donkey work has been put in by XDA members, namely DaxIΠFIΠITY and Brainmaster,who have updated the MIUI Music Player to version 2.3.9. This particular update brings specific support for Ice Cream Sandwich (4.0.3), which was recently boosted by an official rollout for the Samsung Galaxy S II. The interface has been updated to fit uniformly with ICS, and there is also an enhanced equalizer, sleep timer and spectrogram. Users can now shake-to-skip, opt to automatically download album art, add lyrics, check streams, and all the other bells and whistles seemingly part and parcel of any decent music app. Step 1: Download the .zip located at the bottom of this post. Step 2: Reboot device into Recovery (using ClockworkMod or similar) and install/flash the zip file. 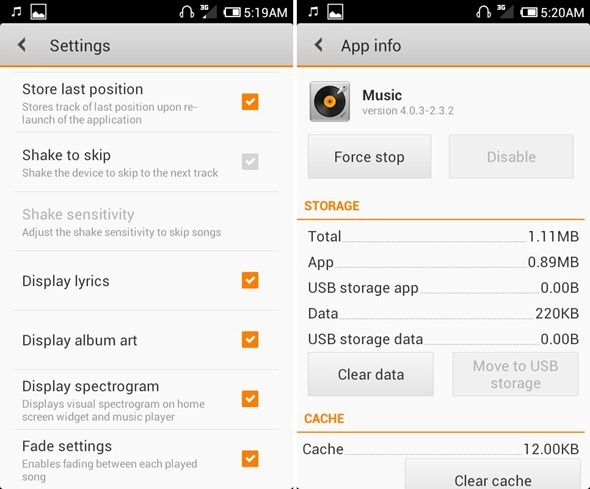 Step 3: Reboot your device, and from there, you should be able to enjoy the MIUI Music Player! NOTE: A few users have reported the app to not be working as desired, so please take this into consideration before thrashing ahead and installing. The consensus seems to be that the music player is more than a little rough around the edges, so we advise installing on a spare device, as opposed to your daily runner. If you get stuck please check out the official thread over at XDA.